If you were growing up in the ‘90s and riding the new wave of Star Wars mania, then one of the stand out toys to accompany the films were Micro Machines, awesome miniature vehicles and playsets to use them in. Micro Machines had vanished by the mid 2000s, but they’re back for The Force Awakens—and looking fantastic. The news was confirmed a while ago with product lists hitting the web briefly mentioned the Micro Machine name, but this is our first look at the revitalised line. Bizarrely enough, the news hasn’t been leaked from a factory, but comes from a Rebel Scum reader who happened to find the toys on shelf at a local Toys R Us—presumably accidentally put out by staff, considering all The Force Awakens merchandise is due to release on September 4th as part of Disney’s “Force Friday” celebrations. 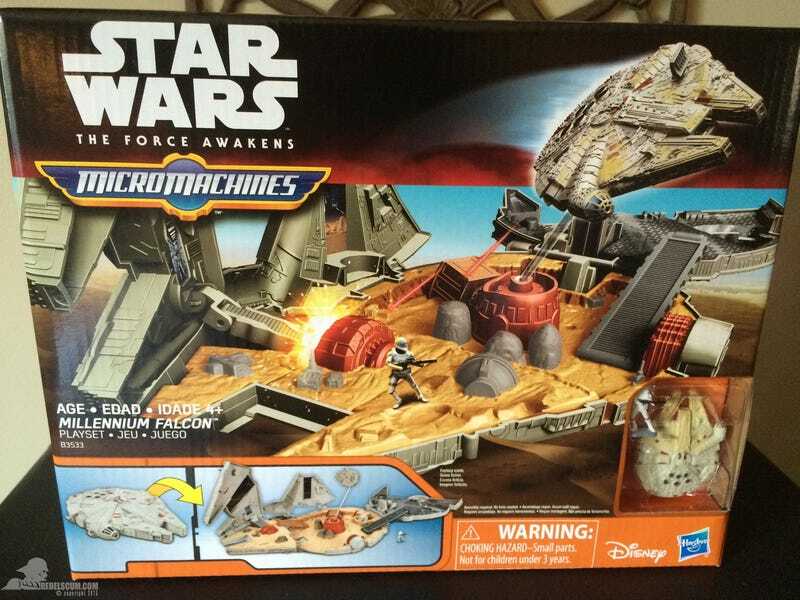 But yes, much to Disney’s chagrin, there’s some Force Awakens merchandise already out there, and it’s goddamn Micro Machines! The playset, a fold-out toy of the Millennium Falcon that reveals a scene based on the desert planet Jakku, is straight up classic Micro Machines—alongside a plethora of miniature space ships, the line frequently included playsets, in the shape of vehicles of the heads of characters like Yoda or Luke Skywalker, that opened up to reveal a scene from one of the films you could potter about little plastic figures in. The Jakku set only comes with one figure, a First Order Flametrooper, but the box teases that additional figures will be sold separately. The box also teases further Micro Machines sets for The Force Awakens—one that’s a First Order Star Destroyer that opens up, the other the head of a Stormtrooper. Presumably more miniatures and vehicles will be available, alongside these sets, when The Force Awakens merchandise is released in September. God, I hope so, because I intend to spend all of my wages on teeny plastic spaceships next month. So many spaceships. You can check out a few more pictures of the set over at Rebel Scum at the link below. For now, I’m going to go and collapse in a puddle of ‘90s notalgia.